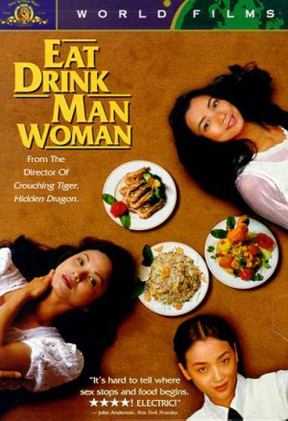 This week's must see Asian films is an old flick, Eat Drink Man Woman. It is one of the early gems of one of my favorite directors, Ang Lee. Fresh out of the success of Wedding Banquet, Eat Drink Man Woman is another movie that uses food and cooking as a major device. Click here to read about another food-themed movie, Like Water for Chocolates. Jia Ning is the youngest and still in school. She started a relationship with a friend's ex-boyfriend. Majority of the movie happens during the Family's Sunday dinner. Mr. Chu's wife is deceased and he takes it upon himself to try and steer each of his children in the direction he wishes them to go. These dinners, however, turns out to be Sunday Sermon service. Unpredictable is the one word I could use to describe the movie. Character were set up so that you, as an audience, would be able to anticipate the decisions that they will be making. At some point, you feel that the director is doing it because what he wants is sympathy from the audience. He wants the audience to slowly feel the pain that the characters are about to experience. He sets up the characters a certain way so he can shock you when the events go the other way. It'll floor you how these characters manage to keep their secrets from you when the director has always been very transparent and honest on how he chose to portray the characters. It is only when you go back and watch closely at how they act and listen closely at what they say will you actually realize that you have been deceived. No, the director didn't manipulate you nor did he give any kind of false information about the characters, he just managed to make you look the other way so you won't notice the real important details that are happening on the other end. You will see some semblance of Ang Lee's incredible ability to create characters that are very real and very relatable. Unlike other filmmakers, he doesn't resort to grandeur or fanstastic character quirks. His characters are very simple and very human. To some, it seems boring and ordinary. However, he has this way of connecting the characters. Each character makes the other more interesting and whole. He is able to create a perfectly synthesized universe where each character becomes vital in the whole story, regardless of how small the part is. His timing is impeccable. He knows just when to deliver the punchline, hold a dramatic scene or use silence to achieve to get the most out of the audience's emotions. The movie uses food as the main device of the story. Expect to get hungry. However, the more important thing to take away is how the movie is able to show just how much life can screw us all big time. We can go and plan for our life all we want but, in the end, what is meant to be will be.